Boy it sure is nice to get home after a few weeks away! All-in-all, we had a good trip. Yes, Provence is pretty although it would be much better at the right time of year - late June/early July. Jenny loved the markets. I thought the Roman ruins were outstanding. The campsite further south near Perpignan was less than thrilling but more fun for the kids. It was less culture; more holiday suburbia. 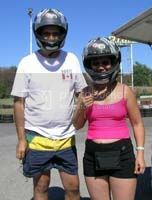 Here's a picture of Jenny and I after racing some gokarts. It was a heap of fun. It was a first time for Jenny so she wasn't very speedy. The kids also got to try some real petrol-powered karts too but on a smaller track. One of a number of things we did.